College Enrolments, Fountain Gate Secondary College Policies, STEM Update, Semester 1 Examinations and study tips from our teachers, Exam Preparation Tips Information Sheet, Redevelopment of Student Planners 2019, Alumni Development Program, Full STEAM Ahead, The Camps, Sports and Excursions Fund (CSEF), Entertainment Books - only 6 memberships left, Doxa UPD Workshop, Legal Constitutional Convention. College Tours can be booked with our College Principal, Pete Hanratty. Please call (03) 8762 6839 to make an appointment. Please take a moment to read the Fountain Gate Secondary College Policies on the College Website to gain an understanding of our procedures, expectations, and our committment to parents, students, staff and our College. Our STEM project is progressing very nicely. We are on schedule to pour the concrete slab for the large extension of the existing building which will occur on Monday 28th May. Please be aware of the concrete trucks entering the College via Victoria Road from 7am. Please follow the directions of the traffic controllers. Year 10 Semester 1 examinations will be held between Tuesday 5th June and Wednesday 13th June, 2018. Year 11 Semester 1 examinations will be held between Monday 4th June and Friday 8th June. Students will receive a timetable outlining subject examination dates to assist with a study plan. Here is some valuable advice and encouragement for students from our very own teachers that may assist during the examination period. Some of these study tips are very important and useful to alleviate any stress or negative attitudes towards examinations. A positive mind is important for effective study. On Wednesday 23rd May a small group of Young Leaders, Fatima Tahirian, Zohal Meraj and Hamza Ahmed, lead by Ngoc Tran, met with suppliers to discuss the redevelopment of the student planner for 2019. The students are very excited about their planned updates and improvements and cannot wait to share the new design with the Fountain Gate community. Part of the new design will involve the inclusion of student’s artwork and as a result the Young Leaders are running a competition. Students are invited to submit their black and white artwork which celebrates the theme of ‘school sprit’. Students are invited to submit a sketch, drawing or photograph, to Miss Byers in the Maths office next to G3 by Friday 27th July. The best 16 artworks will then be adapted to the colours of one of the houses (red, green, yellow or blue) and incorporated into the planner. A prize will also be awarded. Any students who have any ideas or suggestions for the 2019 student planner are also encouraged to forwarded their ideas to the committee in writing via Miss Byers. On the 24th of May, our Year 7 and 8 High Achiever classes participated in a National Video ‘Full STEAM Ahead Conference’. They were given the opportunity to connect with high-profile career professionals from the fields of Science, Technology, Engineering, Arts and Maths (STEAM). The interview panel, consisting of a performance engineer, a software engineer and a video game developer, provided students with an insight on their experiences within these field, discussed the pathways in which they embarked upon and even shared a virtual reality video game demonstration. The students were captivated throughout, and were left with the take home message to always ask questions and never stop learning. 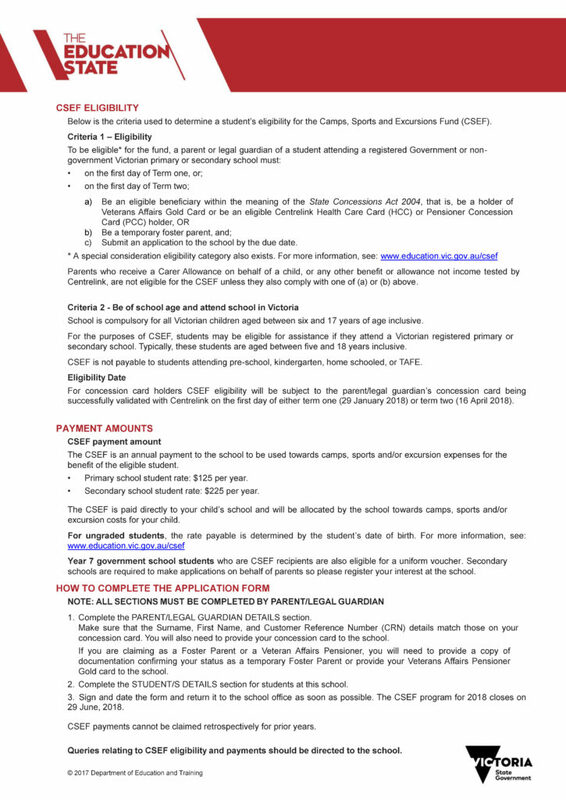 The Camps, Sports and Excursions Fund (CSEF) provides payments directly to the school for the benefit of the eligible student to attend camps, sports and excursions. Families holding a valid means-tested concession card or temporary foster parents are eligible to apply. $125 per year will be paid for eligible primary school students and $225 per year paid for eligible secondary school students. Payments will go directly to the school and be tied to the student. 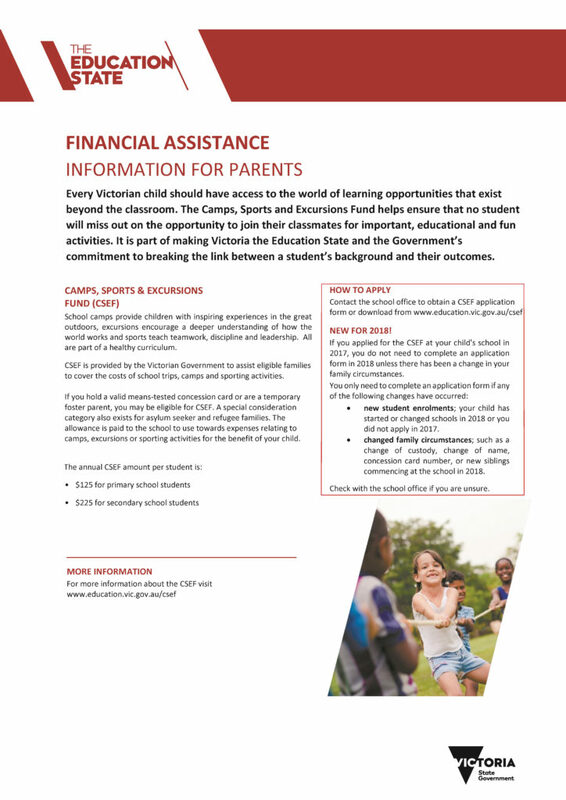 For more information and to download the application form please go to www.education.vic.gov.au/csef. Parents are encouraged to lodge the application form as soon as possible, so that payments can be made from March 2018. 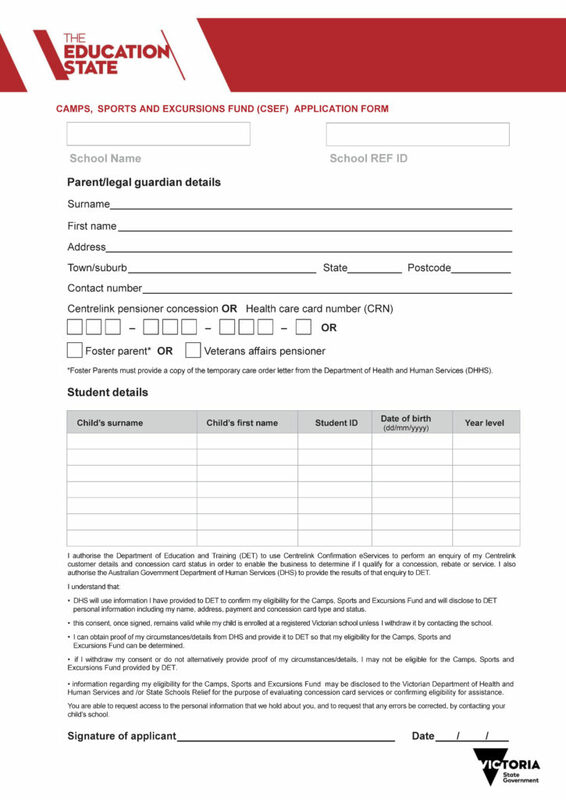 However schools can accept parent applications up until 8 June 2018 for processing in Term 2. For parents who received CSEF at the school in 2017 (and the student/s are still enrolled in 2018), the school will ‘copy’ the application across from 2017 to 2018 on the CSEF system. The CSEF system automatically validated the parent’s eligibility with Centrelink on 29 January 2018. Help us raise for our fundraising by buying an Entertainment Membership from us. You'll receive hundreds of valuable offers for everything you love to do, and help our fundraising at the same time. Hurry, Entertainment Memberships sell out quickly. There are only 6 memberships available. On Friday May 11th, our Year 9 High Achiever Class took part in a half-day University Pathways Discovery workshop run by DOXA. DOXA is a for purpose organisation supporting young people to access positive life experiences, educational opportunities and employment pathways. articulated personal aspirations with optimism for the future developed core skills in team work, communication, decision making and self-reflection. On Tuesday the 8th of May, I was fortunate enough to attend a legal constitutional convention, held at Nossal High alongside twelve other Fountain Gate Secondary College VCE Legal Studies students. The convention was based on the argument of whether a First nations voice should be enshrined in the Australian constitution, where we observed and listened to two speakers who argued against each other’s opinions. Following their remarks, students from our College including students from other schools, were split into five groups for further discussion in the hopes of forming our own individual opinions on legislative issues. After attending this excursion, I was able to gain a deeper understanding of the Australian constitution, and was able to act as an impartial and third party listening to the arguments developing my own opinion. It was a great experience and I am very grateful that Ms. Shmerling and Ms Stathopoulos gave me this opportunity to be able to attend such a knowledgeable event.